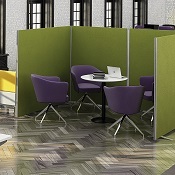 Floor office screens are used to break up the appearance and absorb sound in an open plan office environment and provide the operators with an element of seclusion and privacy. Economy screens have a 25mm MFC core, foam back, and fabric finish. Overall depth of the completed screen is 40mm with 3 screen height options. Screen shapes include straight, curved, half glazed and third glazed. Please contact one of our project consultants if you need any further information on our exciting range of office furniture and accessories and we will be pleased to help.